Traditional Village Freehouse with a beautiful riverside location, set on the very edge of the Exmoor National Park. Situated half a mile off the A39 bewteen Minehead and Williton you will find us tucked in between Cleeve Abbey and Torre Cider Farm. Our idyllic location makes The White Horse Inn the perfect base from which to explore some of Exmoor's most renowned beauty spots. Click Here for map. 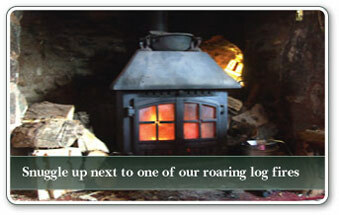 snuggle up next to one of our roaring log fires. along with our seasonal daily specials board. The Menu, which changes on a regular basis, really does offer something for everyone from our signature dish of 'steak & stout pie' through to specials such as Wild-boar Sausages, locally farmed Trout, Rabbit Casserole, Medallions of Pork, Warmed Goats Cheese, .................... and the list goes on!!! The Latest renovations at The White Horse Inn have been to the upstairs where you will find our comfortable bedrooms. These have all been recently modernised to include en-suite bathrooms, tea and coffee making facilities, and colour TV.